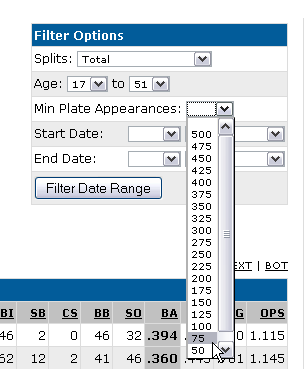 Baseball Reference ran a list of players with most at bats in a season without an XBH. Willie currently ranks 12th with 79 ABs. Dwain Anderson at 124 is the current record holder and must be getting nervous. I really don’t think that he’ll break the record…he just HAS to hit a double right? He’s pretty fast. If he hits the gap at all, he’ll go for it. At the other end of the XBH list, tied with Josh Hamilton for the most XBHs in the American League, is Jose Guillen. I really donâ€™t think that heâ€™ll break the recordâ€¦he just HAS to hit a double right? Heâ€™s pretty fast. If he hits the gap at all, heâ€™ll go for it. Yes, a hustle double will wipe out the record even if it occurs after surpassing 124 at bats. This will be a difficult record to hold on to for him considering he is now playing every day. eddie, #53, you jerk. Now I’m sad. He isnâ€™t the last guy off the bench; heâ€™s the first. Given the composition of the M’s bench, this actually makes a lot of sense. Recently we’ve had a few more options, but for most of the season, was there really anyone you’d like to see off of the bench more than WFB? The point isn’t “Willie is the biggest problem on this team”. We know he’s not. We know Raul’s defense is a bigger deal. But, as Derek has pointed out, we’ve talked about Raul’s defense here a lot. We’ve talked about Cairo here a lot, about Vidro, about Sexson, about all of these things. It’s only fair that we talk about Bloomquist sometimes too. If we talk about Willie too much, that’s not our fault. It’s not us who start it. Announcers and fans haven’t adopted Miguel Cairo as their team mascot; you don’t hear the people in the row behind you talking about how [Cairo] is the sparkplug of this team, and the only guy who’s any good. I’ve heard people say that very thing about Willie. You don’t hear Niehaus talk about how Vidro’s “really hitting well lately”. You don’t hear Dave Valle talk about how Sexson “just needs a chance to play”. We haven’t been hearing for YEARS AND YEARS about how this year’s Al Martin is “really showing us what he can do”. But you hear those things about Willie. Constantly. If people said “Willie’s an adequate, versatile utility guy”, no one here would ever mention his name. But you DON’T hear that; you hear “Willie’s been on fire lately”. SLG .260 is not by any remote stretch of the imagination “on fire”; it is, in actual fact “sucking”. His OBP is decent, and we need a guy like him around to fill in defensively so that the manager has the freedom to use his (sadly nonexistent) pinch hitters. That’s what utility guys are for. Need I mention the fact that Willie has been on this team for SEVEN YEARS NOW, and we’ve been hearing this same untrue stuff about him for SEVEN YEARS, and he’s now earning real money, a million bucks, which is not utility guy money, it’s solid-contributor money? Willie is bizarrely more popular than the GOOD players on this team, and people — MOST people, possibly even ALMOST ALL PEOPLE — believe that he’s REALLY GOOD. Believing that Willie deserves more playing time is an opinion (a stupid opinion, but still an opinion); believing that Willie is hitting well this year is just plain contrafactual. Continually harping on the contrafactual is a good way to piss off the reality-based community. And that’s what we’re getting. The only place you’re going to hear “Willie is a decent utility guy” is HERE. Everywhere else, you hear “I don’t understand, with all the problems they’re having, why they don’t give him a chance to play everyday; he’s proven that he can do it”. And THAT is why I do, indeed, hate Willie Effing Bloomquist. Case in point: If Willie is such a great utility guy, WHY IS HE STARTING EVERY GAME? Steve, I edited your post a little bit because I think you said Bloomquist in one spot where you meant Cairo, or someone else. Hope I understood your intention right; if not I can fix it. If Willie does in fact break this hallowed record, USS Mariner must do something to commemorate this event. The only place youâ€™re going to hear â€œWillie is a decent utility guyâ€ is HERE. Given the composition of the Mâ€™s bench, this actually makes a lot of sense. Recently weâ€™ve had a few more options, but for most of the season, was there really anyone youâ€™d like to see off of the bench more than WFB? Absolutely: the root of this problem is the FO’s inability to construct a more valuable bench. When people talk about their dislike of WFB, it’s surely because he’s being placed (through no fault of his own) in a role for which doesn’t have the skills. He’s a borderline major league being utilised like a borderline starter. Dan kinda works his way around the question by saying Bloomquist is certainly playing well at the moment. He didn’t want to say yes it was funny. We need to rein in our enthusiasm for a pending “major league record”. The Baseball Reference list (linked from #51 above) only covers “full season without an XBH”. WFB would have to make it all the way through Sept to claim the record. If we allow multi-year streaks, Valdivielso continued into ’61, getting to 221 ab + 17 bb + some hbp and sac = more than 240 plate appearances. There are probably others that are even longer. So, Willie has some work to do before he can claim The Record. But, we’re all pulling for him! We need to rein in our enthusiasm for a pending â€œmajor league recordâ€. The Baseball Reference list (linked from #51 above) only covers â€œfull season without an XBHâ€. WFB would have to make it all the way through Sept to claim the record. Yes, I tried to make that clear, but apparently didn’t. But I think it only adds to the intrigue as the season wears on. This will not be an easy record to break, especially if he stays healthy and continues to play everyday. So, Willie has some work to do before he can claim The Record. But, weâ€™re all pulling for him! If we do multiple years, his streak started in July of last year. So we could add some AB’s to his total from this year. Excellent point. His streak started on 7/15 of last year putting him at 143 at bats by my rough calculations. Baseball Reference can run reports for “longest streak”, but they give the result in games, rather than AB or Plate Appearances. That’s how I got the info on Tollesen and Valdivielso. Without a premium subscription, it shows you results with the first and then skips a bunch and then shows you some more. With a premium subscription, you could see more data and get a better answer. If people said â€œWillieâ€™s an adequate, versatile utility guyâ€, no one here would ever mention his name. But you DONâ€™T hear that; you hear â€œWillieâ€™s been on fire latelyâ€. I must be in the minority, but I don’t even think Bloomquist is worth having as a utility player. In my opinion, a well constructed bench does not include Bloomquist (and certainly not Cairo). Joe D. had ‘The Streak’, so I guess this is ‘the steak’. When he breaks the record, I hope the game ball and cleats go in the Hall. It’s a funny/sad string, sad in how the Willy stuff is a commentary on the season. Also, I’m pretty sure Willy isn’t tooting his own horn, it’s just the media people blowing it for him, but I don’t follow every source that covers the M’s. Willy is the feel good spot of happy sunshine in a crappy season. Run Willy Run! Plus it’s fun to yank the chain of the reality based community, you get some great stat analysis that way, whole new ways of looking at the game. You get educated. Another win for Willy! Bocock, Hernandez, Hu and Bixler are all now in the minors. Ensberg was released by the MFY and is now on the Indians’ AAA team. So Robb Quinlan, Bloomquist and Cairo are the only guys on that list that are still in the majors.